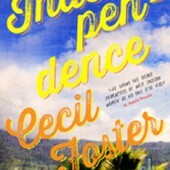 Foster told me this tale for an interview forMaclean’s heralding the publication of A Place Called Heaven: The Meaning of Being Black in Canada in 1996. I remember going to his house in Thornhill where I set up my tape recorder in the living room. His three sons were playing in the background. His soon-to-be-ex-wife was there, too. She looked singularly unimpressed by the presence of one more reporter to celebrate the burgeoning literary career that was driving them to the poorhouse.